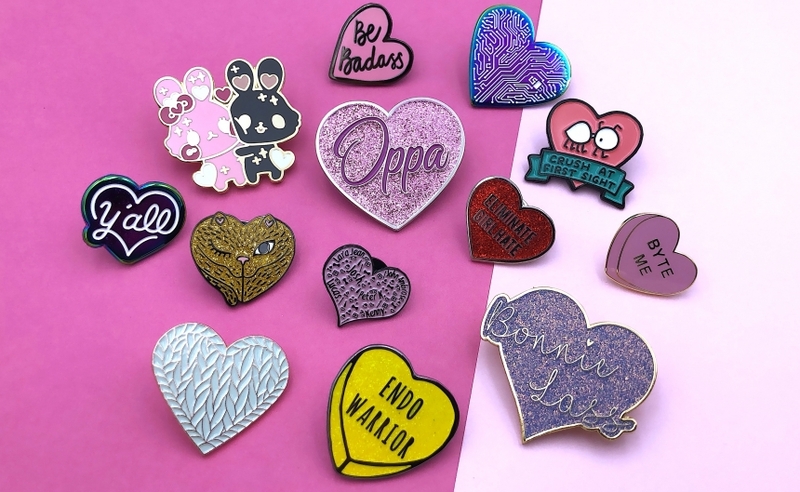 Our Custom Pin Badges can be personalised in all shapes and sizes from traditional heart shaped badges to loving romantic messages. Maybe you are a Designer or Illustrator looking for Valentine themed products to share or sell with unique styles your customers love. Adding little extras like backing cards can say that extra something like “Be My Valentine?” or “Happy Valentines Day!” which can be used as greeting card alternatives or a keepsake for those sentimental statements! And don’t forget, it’s all about that 1 word with 5 letters, you guessed it…sock’s! What better way to say “we make the perfect pair” than with Knitted Socks! If you are a business using Valentines Day as a promotion within store, why not give clients/customers heart pin freebies with orders to share the love. With your logo on each product is is an effective way for customers to remember you and organically share with the public from wearing or sharing the gesture making you stand out from competitors! Our Promotional Jewellery including Cufflinks, Earrings and Necklace Pendant & Chain can be custom made to be worn with love! With a wide range of designs achievable using enamel and plating to suit your designs, hypoallergenic fixing and platings are used to ensure direct skin contact is not a problem for your end consumer. Check out our Instagram page for pinspiration and be ready for all up coming events throughout the year or email our team at hello@madebycooper.co.uk for more information.